Koh Samet, sometimes also written as Ko Samed, is a small, 6.5 km long island on the eastern Gulf Coast of Thailand. This tiny jewel is one of the most beautiful islands around Pattaya and we enjoyed our holiday on Koh Samet. The small islet impresses with its irresistible flair, the incredible variety of beautiful beaches and with lots of amazing nature spots. Here, most of the island is declared as a National Park. 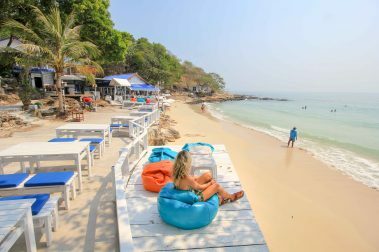 Although Koh Samet has become a popular destination for Pattaya holidaymakers and daytrippers, you will still find plenty of paradisiacal and quiet beaches on the island. 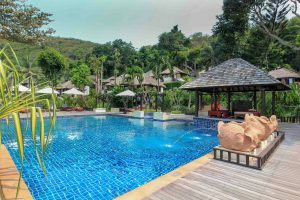 In this blog post we will share all the useful information about a perfect holiday on Koh Samet. Our guide will give you useful tips, show you the best beaches of Koh Samet and where to stay on the island. 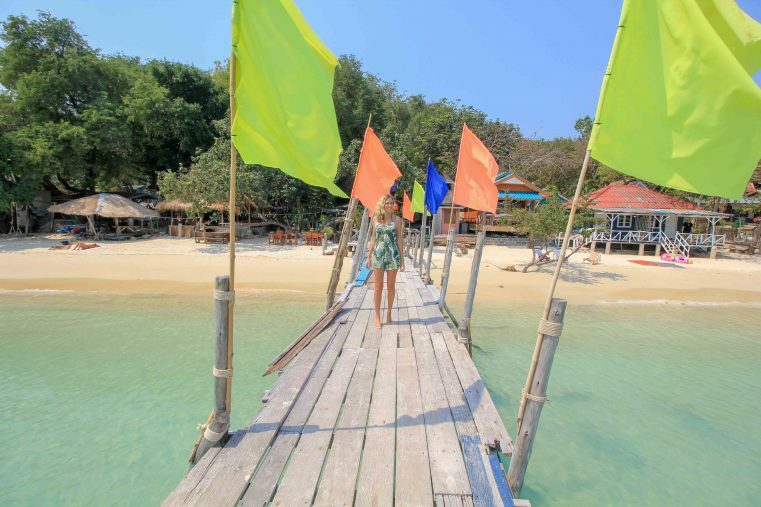 Already at the pier of Koh Samet, visitors are welcomed by one of the most interesting attractions of the island. A mystical mermaid made out of bronze. The statue seems to rise directly up from the sea and welcome the new guests of the island. This huge mermaid is a really great photo spot and one of the coolest things to see at Koh Samui! This beautiful temple is located right in the village, just before you reach the main beach. 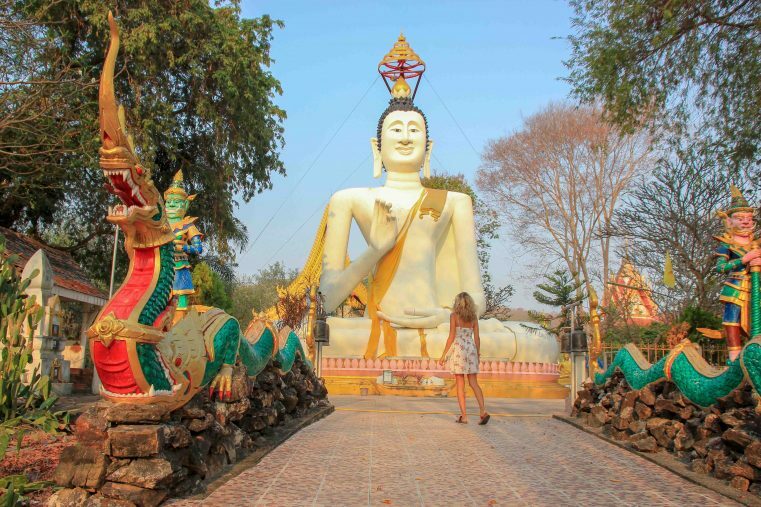 Don`t miss visiting this attraction, because the big Buddha statue is the heart of Wat Koh Samet. In addition, the small temple complex is really worth seeing and so you can definitely take some great pictures for your holiday book. In addition to the large white Buddha you will find some temple buildings with beautiful murals, which tell the legend of Koh Samet. 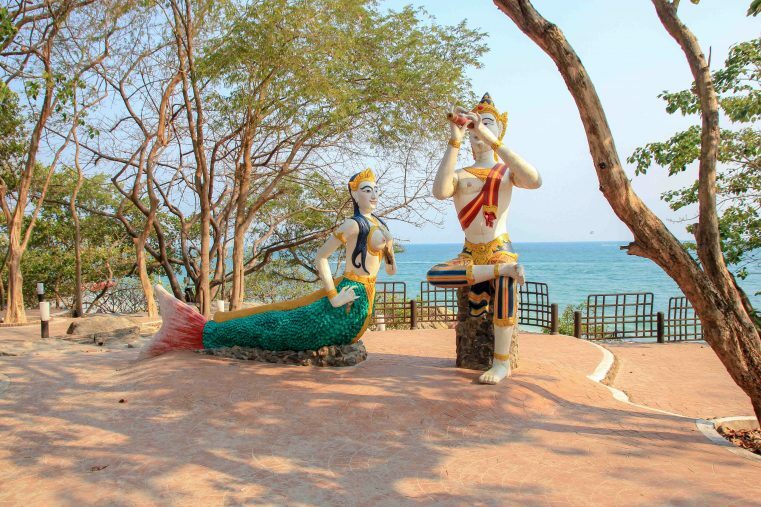 On a tour around the island you can hardly miss the lovely statues at Sai Kaew Beach. 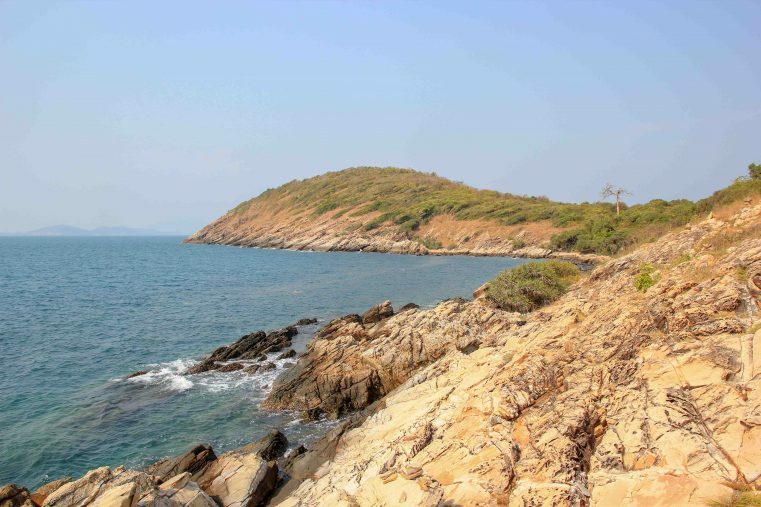 They are almost the landmarks of Koh Samet and are probably the most photographed sights of Koh Samet. 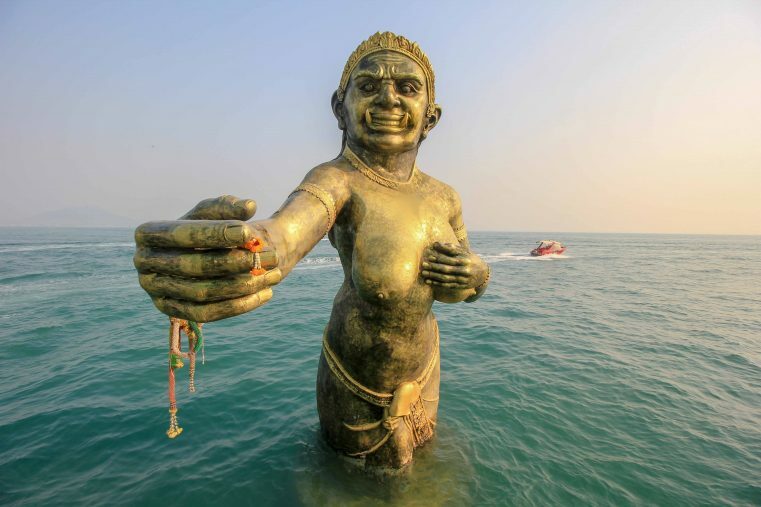 The statue of Aphai Mani and the mermaid are modelled after a well-known Thai legend. What could be better than exploring this wonderful island by scooter? Due to its relatively small size, this holiday island with its great beaches and attractions, can be easily discovered on your own. The prices for the scooter rental are cheap and mostly they are around 300 baht per day. Often, even a tank is included. In addition, the roads are in a pretty good condition and the little traffic on the small island is very manageable. 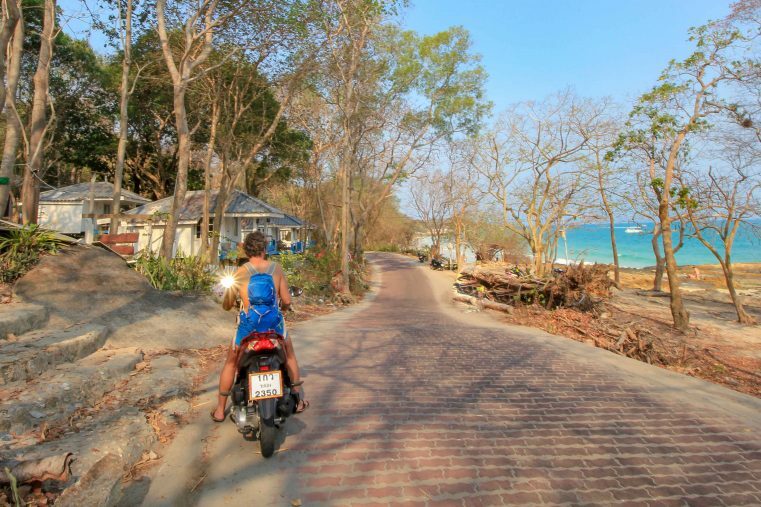 Another cool way to explore Koh Samet is definitely by bicycle (about 150 Baht per day). These are also, as the scooters, offered for rent. If you do not want to drive yourself, you will have the possibility of getting around Koh Samat by one of the green shared taxi. They will bring you to the various beaches of the island for a small amount of money (from 30 Baht). Sai Kaew Beach is the island’s main beach and a popular destination for day trippers from Pattaya and Rayong. Actually, this white velvet dream beach is heavenly, but unfortunately the hustle and bustle has become too much here. Only in the late afternoon the beach gets a little more peaceful. Later in the evening, the nightlife takes over and many restaurants and beach bars open along the beach. 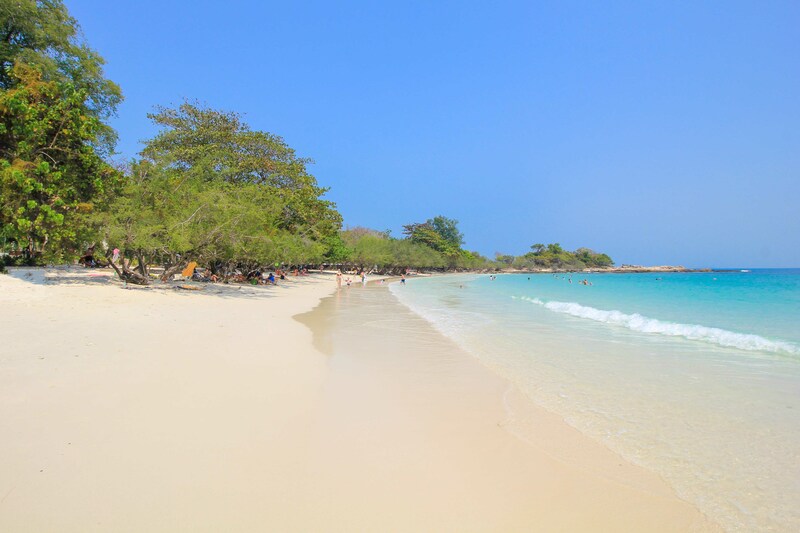 For those who prefer a quiet holiday, just visit one of the many other beaches at Koh Samet. 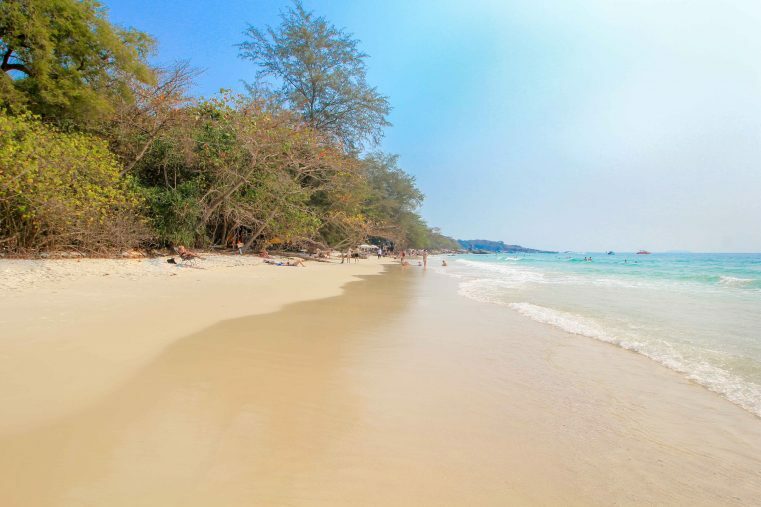 Not far from the main beach there is one of the best beaches of Koh Samet, the Ao Hin Khok. As you can see on the picture below, there is noticeably less going on here. Also here, the sand is really fine, the water crystal clear and turquoise blue. This sandy beach is great for swimming and the trees provide cool shade at lunchtime. This beach is an absolute highlight of the island and so for many the Ao Prao is the most beautiful beach of Koh Samet. Once there, you immediately feel like you’ve landed in paradise. Fantastic sea water, huge palm trees, soft sand and lots of holiday flair. Also, you will find really lovely hotels here, but more later! Tip: Don`t miss to visit the Ao Prao Beach for sunset. So for those who want to enjoy a nice quiet holiday on Koh Samet – the Ao Prao Beach is a perfect choice to stay. The Ao Thian Beach is located in the middle of the island and has a variety of small bays. This beautiful beach is quiet and really cozy. With a little luck, you’ll even have a stretch of beach to yourself. Next to the rocky outcrops there are also great places for snorkelling on Ao Thian Beach. A picture-perfect ambience makes Ao Wai Beach one of the top beaches in Koh Samet, maybe even of Thailand. The contrast between the pale white sand and the turquoise-blue sea is almost cheesy and unreal. In addition, the beach is very flat and perfect for families. The Ao Wai Beach is wonderful for swimming, snorkelling or just enjoying a perfect day on the beach. 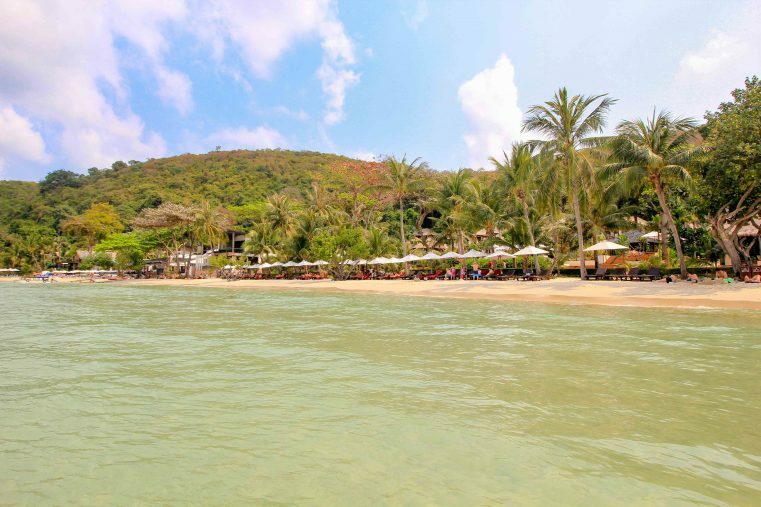 The Ao Lung Dum is by far our favourite beach! Powdered fine white sand and crystal clear turquoise-blue sea almost like in the Caribbean, hardly any tourists, the beautiful jetty and the cozy Apache restaurant conjure up a beach ambience that is unparalleled. If you like it quiet, you should definitely stop here. The Ao Lung Dum is one of the best beaches on Koh Samet and should not be missed! Another fantastic beach is the Ao Cho. This beautiful stretch of beach is one more bathing highlight of the island. Along the sandy beach you will find a few cozy restaurants where you can enjoy the wonderful beach atmosphere. Again here are some good opportunities for snorkelling and swimming. 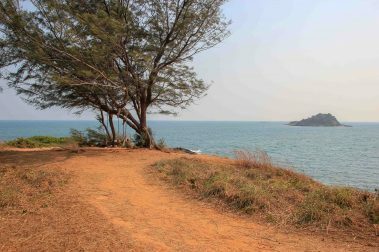 A large part of the island and therefore most of the beaches belong to the Khao Laem Ya National Park and so each visitor will be charged automatically a National Park fee. 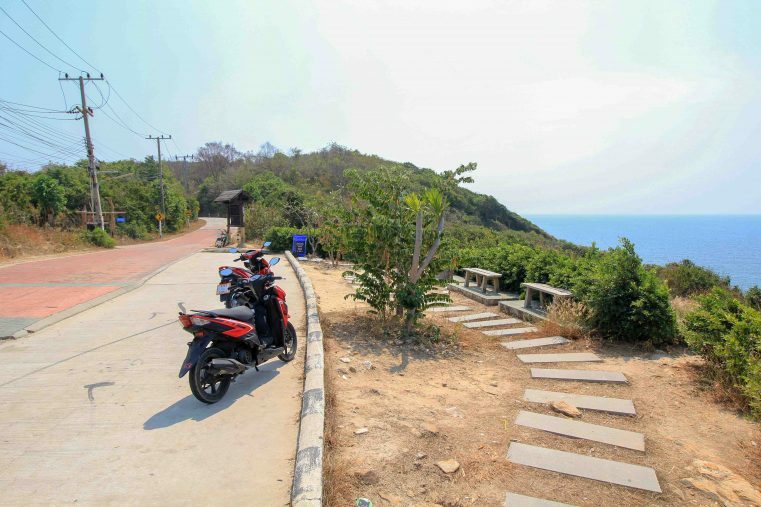 The entrance fee is at the moment 200 Baht (for tourists) and the ticket has to be paid directly at the National Park Entrance in Koh Samet Village. The entrance ticket is valid for one week and will be checked every time you enter the park area! 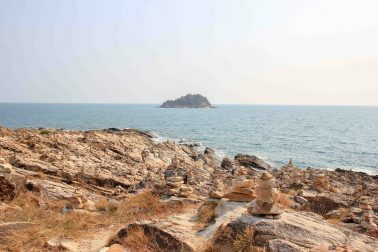 On the southern part of the island is a beautiful cape, the Laem Toei. The small rocky coast is more reminiscent of Croatia than Thailand. Here, in the very south of Koh Samet, you have an incredible view over the rugged cliffs and the Mediterranean vegetation. The peaceful atmosphere is incredible and so this beautiful place invites you to linger! Tip: From the parking there are two walking paths to reach viewpoints. Both are highly recommended and accessible via an easy short walk through the forest. 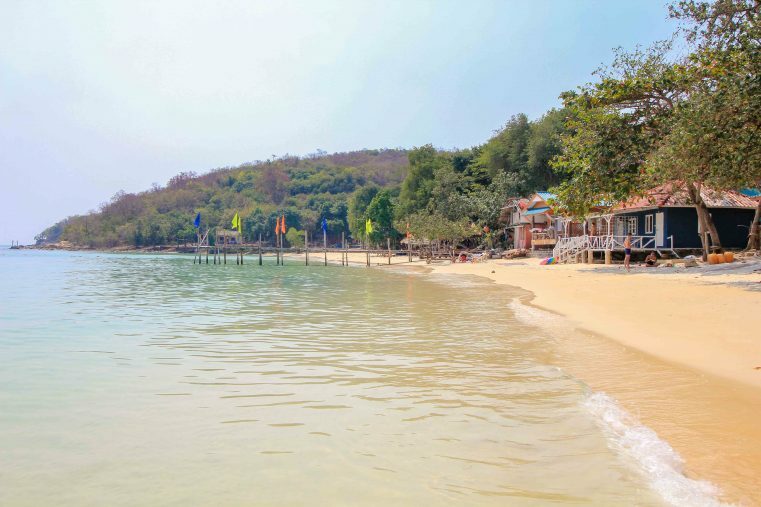 Koh Samet offers a high range of ever-popular activities such as jet ski, sightseeing trips, scooter tours, numerous water activities, kayaking and massage. Also, there is the possibility to make excursions to see the nearby islands. So, most of the boat trips are island hopping tours where snorkelling is offered. 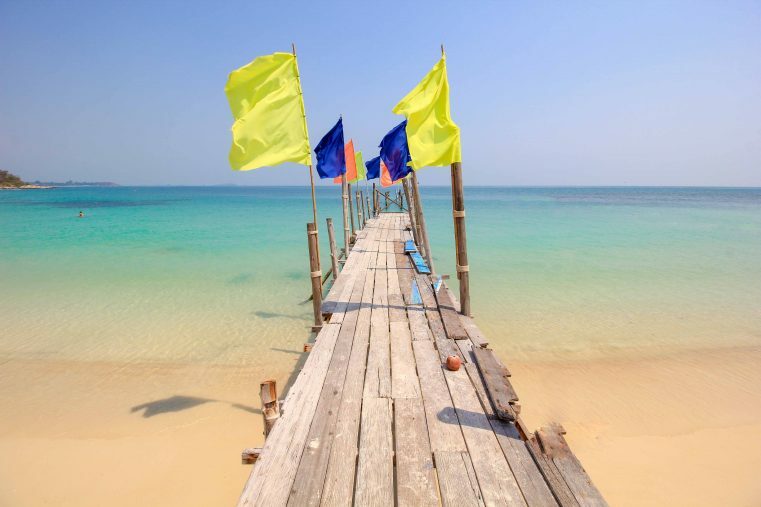 Depending on the tour, up to 9 different islands can be visited from Koh Samet. The tours cost between 400 baht – 1,500 baht, depending on the duration of the trip. 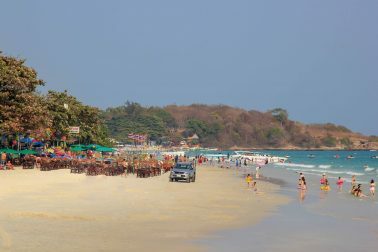 The nightlife of Koh Samet takes place on the main beach, the Sai Kaew Beach. Here is the best place to party. There are also some good restaurants and also the fire show is really nice to see. The fires shows start every day at 21:00 clock. Otherwise, on the main street of the village you will find some nice bars and restaurants. Really delicious is the food on Koh Samet in the famous Funky Monkey restaurant. 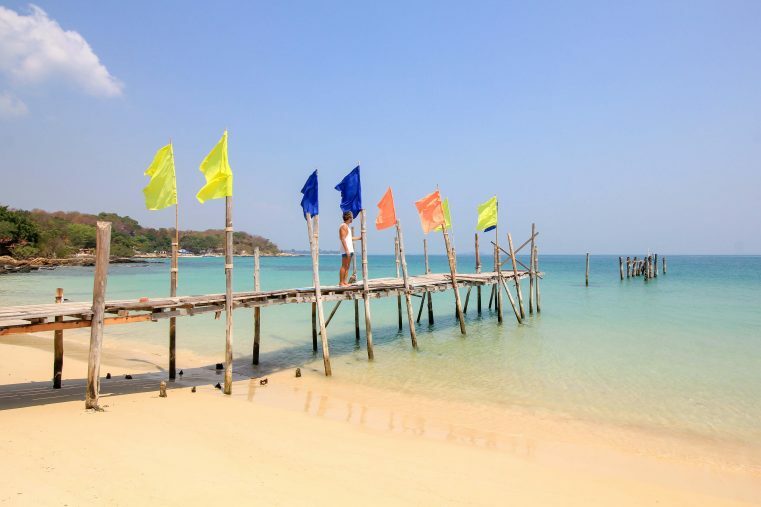 When to visit Koh Samet? The best travel time to visit Koh Samet is from November to the end of February. The rainy season on the island is from June to October. However, most rain is expected in September and October. However, as it is generally very dry on Koh Samet, you can often visit it very well until August. 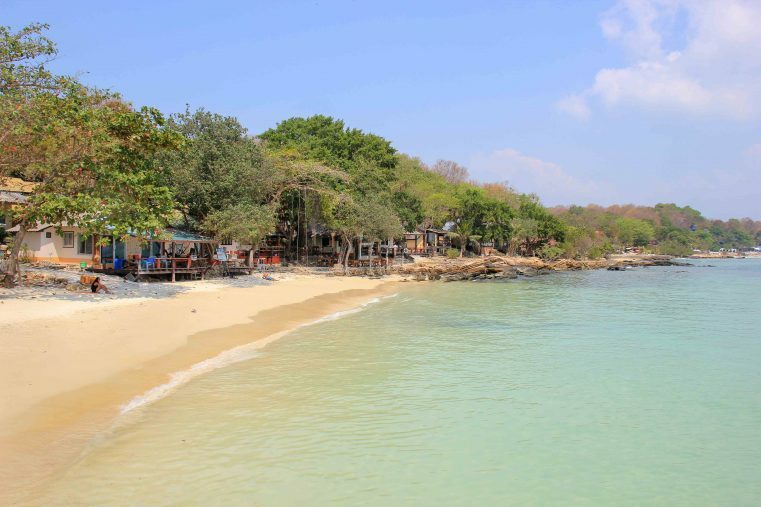 Since a couple of years, Koh Samet has also become a popular island for locals from Bangkok and Pattaya. So, during the week noticeably less goes on than at the weekend and also the prices are lower on weekdays. If you want to travel from Bangkok to Koh Samet, it is best to take the public bus from Ekkamai Terminal. It operates every hour and stops right across the pier. From Bangkok you will have to drive about 190 kilometres and the ride takes at least 3-4 hours depending on traffic. The bus ticket costs 155 baht. The ferry to Koh Samet starts at Nuanthip Pier. The one-way ticket costs 70 baht and a round trip cost 110 baht. By contrast, speedboats are more expensive. A ticket costs around 200-500 baht. Koh Samet has a good selection of accommodations, hotels and bungalows. Here you will find every price range, whether cheap backpacking hostel, middle class accommodation on the beach or luxury hotel with private beach. Especially during the week, you will find amazing bargains! Especially recommended are the pretty beach bungalows at Nimmanoradee Resort. 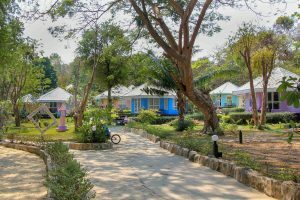 This hotel is located on Ao Pakarang Beach and impresses with its colorful cottages, quiet location and beautiful beach. Click here for the resort! One of the most beautiful hotels in Koh Samet is Le Vimarn Cottages & Spa. The quiet location, the great beach and the wonderful pool area will make your holiday really special. Click here fore the dream hotel! 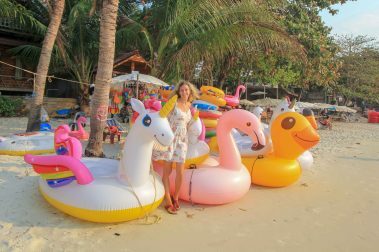 Conclusion: Is Koh Samet worth visiting? YES! Koh Samet definitely belongs to the TOP Islands of Thailand and is one of our absolute favorite places. 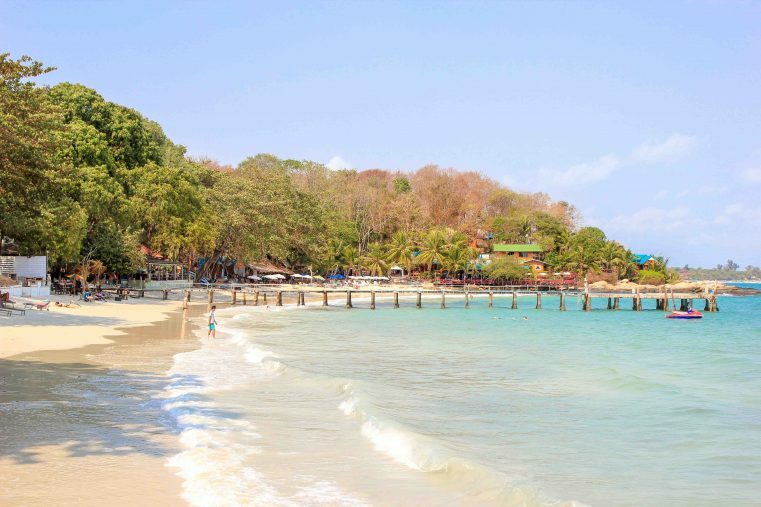 The beaches are amazing and a holiday on Koh Samet will definitely be an unforgettable experience for you!